La Belle Vue #933 has had a wonderful Questers Year this fall and winter. In September our Meeting Place was the lovely Joslyn Castle. La Belle Vue President, Lu, volunteers at the Joslyn as a Docent. Lu served as our docent and tour guide for our program. Lu shared many stories and made the castle come alive for the ladies and their guests. Our hostess for the day was Marge. 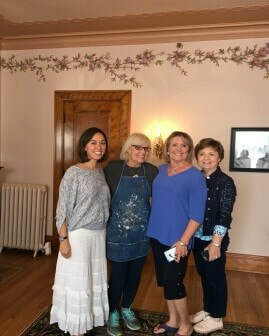 The ladies had a real treat when we toured Mrs. Joslyn’s bedroom which is being restored to its original paint and border. The artist, Vija Bolin, was just putting on the finishing touches and we got to watch her fascinating work and listen to how she accomplished it. In October, Bev invited us to the home of world traveler and adventurer, Betsy Buschkemper. Betsy presented her exciting life story as she related interesting stories and showed the group her collections from all the places she has lived and traveled. Betsy has led an amazing life. As winter begun to surround us in late November, the ladies of La Belle Vue found warmth and cheer at Lori's home. Lori gave a program on Vintage Christmas Blow Molds. Her home was “Beginning to look like Christmas”. In December, Chalice welcomed us into her home for a delicious soup luncheon in her lovely decorated home. It was a delightful way to enter into the Christmas Spirit. January found us at the home of Pam. Pam shared her recent trip to Ethiopia with a focus on the famous rock-cut monolithic churches. Foremost was the church in Lalibela, the high place of Ethiopian Christianity. Pam shared a slide show which showed the beautiful Church. Pam explained the high feast day of the Baptism of Jesus as she related their experiences in being present in Lalibela for this day of pilgrimage and devotion. La Belle Vue is so proud of their new members this year, Mariah and Jeanette.